We have chosen not to show Namigadde’s photo, as she is in danger of violence in her home country of Uganda. We begged UB readers yesterday to please sign a petition to prevent Brenda Namigadde from being deported home to Uganda in the aftermath of LGBT activist, David Kato’s murder this week. We did it! The literally last minute temporary injunction came from a judge after Namigadde had already boarded a plane headed to Uganda via Nairobi, Kenya last night. Can you imagine how hard this woman’s heart must have been beating in her chest as she boarded that plane? Namigadde has been identified the world over as a lesbian. 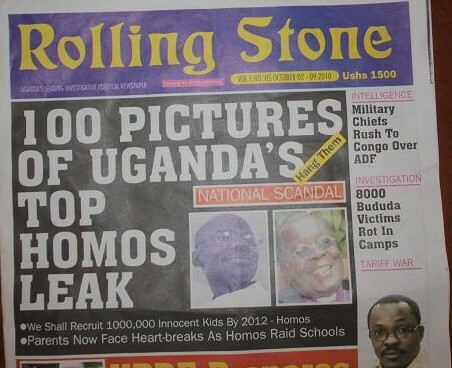 Uganda, you should know by now, is infamous for the country’s Rolling Stone magazine’s cover stories calling for the hanging of over 100 men and women accused of being homosexuals. The newspaper printed photos, names, and the addresses of those it conspired against – which inevitably led to the murder of David Kato outside his home. Namigadde’s life very well may have been saved last night by the crowdsourced petition to the UK immigration department that many of our readers signed. Long before the killing of Mr. Kato, Ms. Namigadde had become an icon for a global network of human rights activists and campaigners for gay and lesbian rights. In the years that her case has been before British courts, they have depicted it as a landmark in the fight to secure the rights of homosexuals around the world, including the right of asylum outside their homelands for citizens of countries that persecute homosexuals. The campaign has attracted strong backing from the Obama administration, but has been condemned by some African and Arab countries and by conservative religious groups, especially in the Muslim world. The fight for the safety and rights of LGBT Ugandans is still far from over. What this story has accomplished however, is an involuntary look at human rights, immigration laws, and political asylum by many of the world’s nations. The world community simply will no longer allow governments to send immigrants home to their deaths. Good work, Unicorns. We’re all in this together!